You don’t even know it, but I’ll show you that it’s true. Let’s say you need car insurance. Maybe you want a lower rate than your currently getting. Odds are most of you will start your search for cheaper car insurance online–probably with a Google search, according to the numbers. What do you type into the search box? Did your search contain a brand name? And because that’s the case, most of us are paying more for car insurance. And more and more of us are realizing that the old way of getting auto insurance quotes online is a letdown because of it. What Does How I Search Have to Do with What I Pay? If you search for GEICO auto insurance, you know what shows up in the search results? GEICO auto insurance—with very few exceptions. If that is what you search for and that is what your search turns up, statistics show that will be the brand of insurance you are most likely to buy. But that doesn’t mean that it’s the right insurance coverage for you. A study by finance website NerdWallet.com has shown that auto insurance comparison is the best way for drivers to save money on their car insurance premiums, with potential savings of up to 32% per year. The same study states that most drivers overpay by about $368 every year. The findings are further supported by a study conducted by J.D. Power. Auto insurance comparison can change that. You can see the value of one policy versus another when you take the same amount of coverage for the same drivers and vehicles in the same zip code and put them side by side. The problem with that is that up until now, that’s required a lot of work on the customer’s part. Auto Insurance Comparison: More Work than it’s worth? Are you good at making spreadsheets? Most consumers aren’t. But that’s one thing that would make it easier to compare car insurance the old-fashioned way. You’d have to pick a handful of insurance companies (5 is the number you’d need to get a good comparison—and even then, that’s 5 out of more than 300 insurance companies in the U.S.) and get a quote from each and every one. You’d have to fill out all of their forms, making sure you put in identical information for each one, and then you’d be able to compare auto insurance. It’s painstaking, time-sucking work and most people don’t want to do it—but it’s costing them. A lot of the insurance-buying public thinks that auto insurance comparison is available from brands like Progressive who claim to give you their rates and the rates of their competitors. The only problem there is that they aren’t giving you verified prices. Customers who want to get a competing quote must visit the competitor’s website and start the process all over again. Why? Because Progressive and similar sites simply provide you a potential range of prices. The information you provide to Progressive, for example, is not also sent to the other insurers. That requires a special kind of IT infrastructure that, even in its simplest incarnation, is confusing, expensive, and difficult to establish. Progressive can only provide a general range. We’re not just picking on Progressive, though. There are hundreds of websites out there that claim to offer true comparison, but they are really just a referral service. The “quotes” are estimates and again, you’ll have to complete the form all over again once you decide to buy. What’s worse—many of these sites sell your personal information to insurance companies and that leads to dinner-time phone calls and a never-ending supply of junk mail. The moral of the story is that true auto insurance comparison didn’t exist until now. How many insurance companies can you name? We’re willing to bet you can only name most of the insurance companies who advertise on TV. That’s roughly 8 to 10 insurance companies. Care to guess how many insurance companies exist in the U.S.? Over 300 (close to 400, actually). It’s not probable that out of 300 car insurance companies, one of those 8 insurers that advertise on TV can offer you the lowest price. But aside from not knowing the names of other potential insurance providers, what keeps customers from buying from these other brands? To most consumers, if you can’t afford to advertise on TV (or choose not to), then you must not be credible. You must not be trustworthy. Those large insurance companies have done a fantastic job of training us to think this way. Unfortunately, that point of view is likely costing you money. There are numerous reasons to go with a smaller insurance company. We won’t run through them all here, but if you’re interested, we’ve talked about it briefly in other posts. The point is that as long as an insurer is financially stable and provides you with quality service, there’s no reason to pass them up based solely on their name. As a matter of fact, many of the insurance companies who get this treatment are actually owned by larger insurance companies. 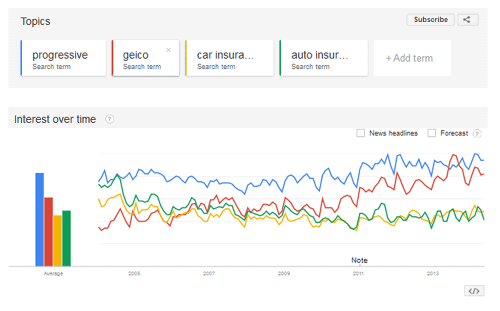 Why do we Search for the Major Brands and Omit Smaller Insurance Companies? From the average consumer perspective, it’s about trust. You only trust the names you’ve seen before—but the catch is the context in which you’ve seen these names. As a consumer, you aren’t out reading J.D. Power’s consumer surveys or looking at financial rating firms’ reviews of these insurers. You know the names from their advertisements. It’s a cognitive bias most people don’t realize they have. Don’t be a Sucker for Advertising. You’ll find the advice to be virtually universal on how to find very cheap car insurance. Just about every finance blog, nearly every talking head will tell you that comparison is how you get the best price and save money. Brand loyalty isn’t necessarily doing you any favors. So find out if you’re getting the best deal right now by getting your free quote for auto insurance.